Bless someone with a beautifully designed floral, get well card encouraging a loved one's return to health. - Folded card size: 4-1/2" x 6-9/16"
and be comforted by His love. as you are held in prayer. Inside: Praying the Lord will give you all you need and take extra-special care of you today. 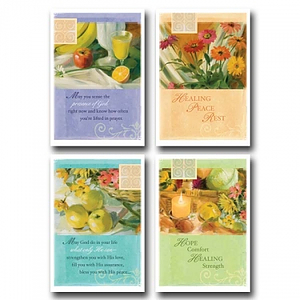 Get Well - Hope and Healing - 12 Boxed Cards was published by Dayspring in December 2007 and is our 2027th best seller. The ISBN for Get Well - Hope and Healing - 12 Boxed Cards is 081983326783. Be the first to review Get Well - Hope and Healing - 12 Boxed Cards! Got a question? No problem! Just click here to ask us about Get Well - Hope and Healing - 12 Boxed Cards.